CANDID CANINE: County Fair Miniatures - What is that?? County Fair Miniatures - What is that?? Yes I'm still alive out here. ha! And... I have been working on miniatures! The special category project this year was a miniature scene up to 18" square based on a nursery rhyme with sheep as the fair theme is "See Ewe at the Fair!" So... here I thought people would pick Little Bo Peep, right? Well... one of the six entries did. The three top entries all picked Baa Baa Black Sheep! haa! The needle-felted sheep below got first place. A scene with a farmer and a stuffed sheep figure took third. I got second place. I wanted to do some plays on words so I created Baa Baa's Wool Emporium. (The sign on the back wall at right explains my "sheep" creature. ha! The fun was coming up with the puns on the signs and making the "ugly" sheep. The sheep is made of paper clay and toothpicks with some fake hair. Kind of looks like part dog and something else, right? haa! I made all the accessories. The neat little pair of clippers on the cutting pen are made from painted Crayola Model Magic. The end and top are made from aluminum tape. The cord was cut off a miniature electric bulb. I had fun with this, trying to think up something different. The wood wool bins are made from a wood bead (by the front door, not shown) and a curved thread spool. My other new project was finishing my Witch's Potions Scene, based on this fantastic art. (See the previous post on the picture and background.) I added the cat in since this photo was taken. (I'll take another photo once I bring it back home.) I still have to work on the doll though I may just leave this as it is. It's in a book box which is fun as I can simply close it like a book, if needed. 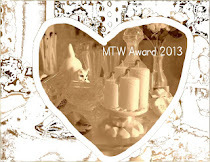 It got first place in the collage category in Cultural Arts. The background is painted bamboo from a place mat. The round arch is painted paper clay. And now I see that I have to cut down that left side wood strip a little. The hat is handmade as is the felted mouse cut-out hanging there. The green face is painted Model Magic clay. I used one of those Sculpey push molds and added ears and fake hair. 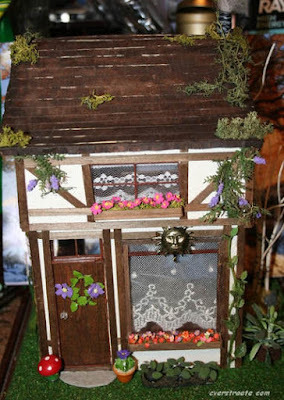 I also entered my half scale Herbal Witch's Cottage in the miniature house category. I took out the front tree for now since I didn't want to light it. I also have a small horse in front. (See website photo.) It also got a first place. Big surprise was I forget how literal the judges can be. I fretted over this plant and didn't think of the poppy-looking plant not fitting. I was looking at the colors for the Artificial flower arrangements, fall, category. It didn't place as they considered the poppy a spring plant. I'll remember that for next time. The other surprise was my entry of small flowers for Artificial, hand-made flowers. I always enter some mini plants in this category. This year's got a first place - and a Reserve Grand Champion ribbon!